How high are realtors´ and lawyers´ fees in Cyprus? What about other property purchase costs? 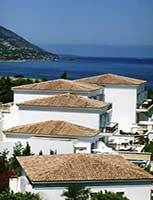 How difficult is the property purchase process in Cyprus? Foreigners can buy one home in Cyprus, and are entitled to hold land freehold, but there is a maximum limit on land ownership of 3 donums (4,014 sq m). A permit to register a property is needed from the government, but can easily be obtained through a lawyer. However since Cyprus´ accession into the EU on 01 May 2004, there have been plans to ´de-restrict the housing/property sector. The plans target to allow unencumbered property acquisition by 2011. Before the EU negotiations, no foreigners could rent out property. Even today, non-EU property owners cannot rent out property. After the offer is accepted, a nominal deposit is made which can be as low as CY£ 2,000. This deposit is binding, so there is no gazumping. The contract is then drawn up, and on signing, the buyer has to pay 20% to 30% of the value of the property, the remainder being payable according to the contractual terms agreed. The contract must then be deposited at the land registry, within two months of signing. A non-Cypriot buyer must then make an application to the Council of Ministers to acquire immovable property - largely a formality - including bank reference, criminal records, the size of the land, and a statement that this is the only home he will hold in Cyprus. Though the procedure can take up to one year, there is meanwhile no restriction on using the property, and in the unlikely event that approval is not granted, the buyer can re-apply, and anyway has 17 years in which to sell the property. Nor does lack of approval affect inheritance rights. Exchange rate as of 16 Feb 2007: 1 € = 0.578449 CY£. The transfer tax is levied at progressive rates. The transfer tax is based on the purchase price or market value of the property, as determined by the Land Registry department. If the property is in joint names, the property value is halved, leading to lower transfer fees. No transfer fees are payable if the transfer of immovable property is subject to Value Added Tax (VAT). Buyers of new real property are liable to pay Value Added Tax (VAT), which is levied on the purchase price or market value of the property. The standard VAT rate is 19%. A reduced VAT rate of 5% may apply on the acquisition and/or construction of residences of first-time buyers, with area less than 250 sq. m. The reduced rate may also apply on the acquisition and/or construction of residences for use as the primary and permanent residence for the next ten years. Services of solicitors are not required but highly recommended. Legal fees are generally negotiable, between €850 and €1,730. Stamp duty is levied on documents related to Czech Republic property. Stamp duty rates are levied at progressive rates, depending on the purchase price of the property. Stamp duty is capped at a maximum of €20,000. Real estate agents typically charge 5% of the purchase price as their commission. By law, minimum agent´s fee is 3%. How landlord-friendly is the law in Cyprus?